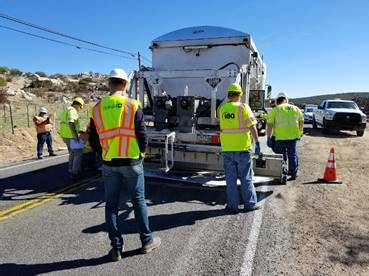 Project Completion: 2018 Description: This Caltrans project located in Campo, CA within San Diego County, required specialty testing to achieve the high friction surface treatment adherence to the roadway surface. Designated for areas where friction is a concern, this specialty epoxy coating and calcined bauxite, creates 200% more friction than your typical chip seal. This process takes a short amount of time and traffic can resume only hours after the mix is applied. Scope of Work: Quality Control Inspections and Laboratory Material Testing for Plastic Ultimate Tensile, Viscosity, Aluminum Oxide, amongst other testing.